When 10-year-old Kristen Sanders, of Bardstown, KY, was taken to a local hospital, complaining of pain in her left leg and hip, her mom Kim had no reason to suspect anything other than one of the relatively minor emergencies that are a part of childhood. As a parent of three girls and three boys, Kim had experience in a variety of situations. But that experience did not prepare her for the fast-moving strep infection that was quickly endangering her daughter's life. Doctors were able to save the young girl's life, but the infection resulted in the loss of both of her legs above the knee and her left arm. The challenge for Kim now is a 10-year-old daughter who is interested in being active, doing things on her own, and living the life of an average pre-teen. 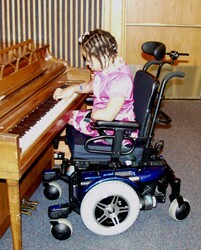 Kristen's Q600 Power Chair is playing a major role in that endeavor. Kim said her daughter enjoys the same activities as her peers. "She likes to spend time with her friends, and talk to them on the phone all the time, and play video game with her sister," Kim explained. "Plus she loves school. It was tough for her being out of school for so long when she was sick." Kristen's Q600, said Kim, allowed her to return to school earlier than she otherwise would have and gives her the freedom a 10-year-old needs. "It makes her feel like she's a little more in control, it gives her a little more power over her own life," said Kim. The Q600's maneuverability allows her freedom at home too. "She can get around the house very well. So she helps with housework and stuff, and she can get on the computer on her own." Kristen received the Q600 at the Shriner's Children's Hospital in Lexington, where she worked with Occupational Therapist Michal Preston. "Kristen is a very spirited little girl," said Michal. "She was a lot of fun to work with. She's a smart kid and a quick learner." 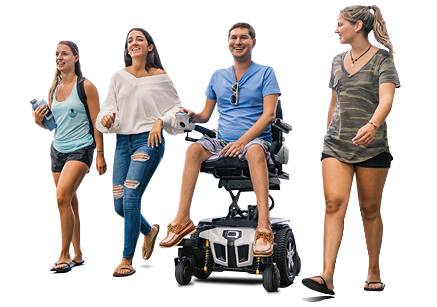 The Q600, Michal said, was the right power chair choice for Kristen for several reasons. The Synergy Seating System was tailored to Kristen's needs, including an elevating residual limb support. In addition to simple comfort, the proper positioning is vital for Kristen's overall health, Michal noted. Also, the small turning radius and Mid-Wheel 6 stability meant that Kristen had practically instant access to her environment. "She was okay driving right away," said Michal. "There really wasn't much of a learning curve at all." For her part, Kristen is less interested in power chair specifications and more interested in hair and makeup, playing outside, playing video games, and daytime television. Naming her heroes as Oprah Winfrey and Montel Williams, because they use their forums to inspire others to greatness, Kristen is eager to make her own mark on the world. She's setting no limitations for herself and, with her Q600 Power Chair, limitations are the last thing she'll need.